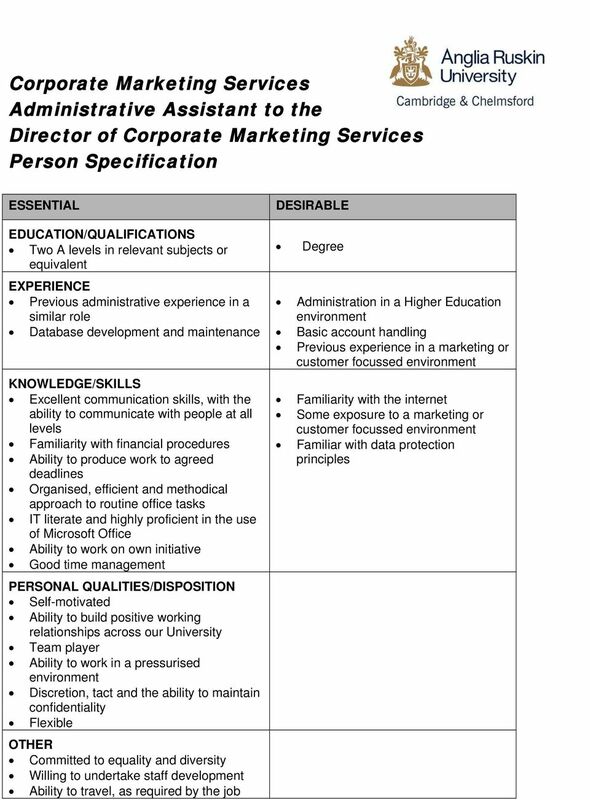 Download "Administrative Assistant to the Director of Corporate Marketing Services. 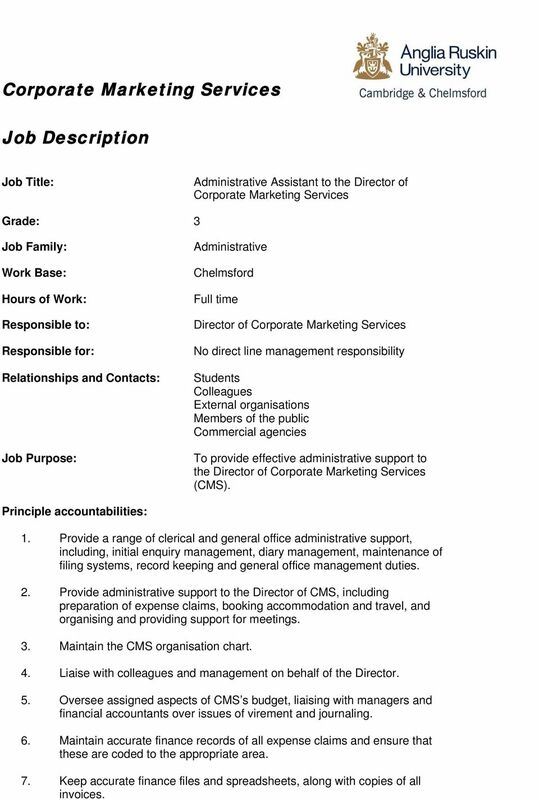 No direct line management responsibility"
1 Job Description Job Title: Administrative Assistant to the Director of Corporate Marketing Services Grade: 3 Job Family: Work Base: Hours of Work: Responsible to: Responsible for: Relationships and Contacts: Job Purpose: Administrative Chelmsford Full time No direct line management responsibility Students Colleagues External organisations Members of the public Commercial agencies To provide effective administrative support to the (CMS). Principle accountabilities: 1. Provide a range of clerical and general office administrative support, including, initial enquiry management, diary management, maintenance of filing systems, record keeping and general office management duties. 2. Provide administrative support to the Director of CMS, including preparation of expense claims, booking accommodation and travel, and organising and providing support for meetings. 3. Maintain the CMS organisation chart. 4. 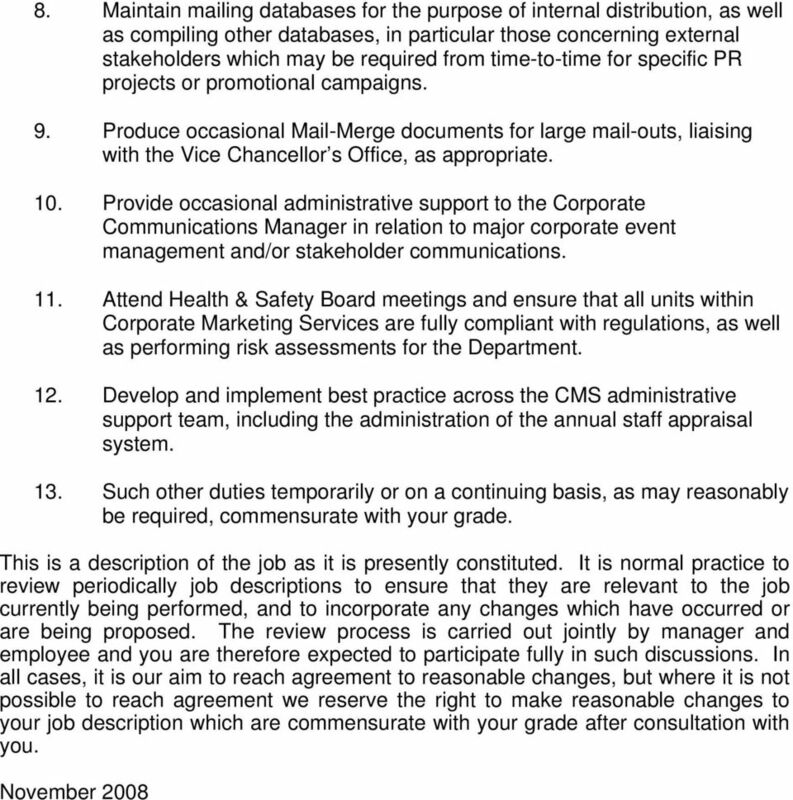 Liaise with colleagues and management on behalf of the Director. 5. Oversee assigned aspects of CMS s budget, liaising with managers and financial accountants over issues of virement and journaling. 6. Maintain accurate finance records of all expense claims and ensure that these are coded to the appropriate area. 7. Keep accurate finance files and spreadsheets, along with copies of all invoices. 5 be assessed. We reserve the right to extend your probationary period if, in its opinion, circumstances so require. (h) Date of Appointment The position is available immediately once all conditions have been met. 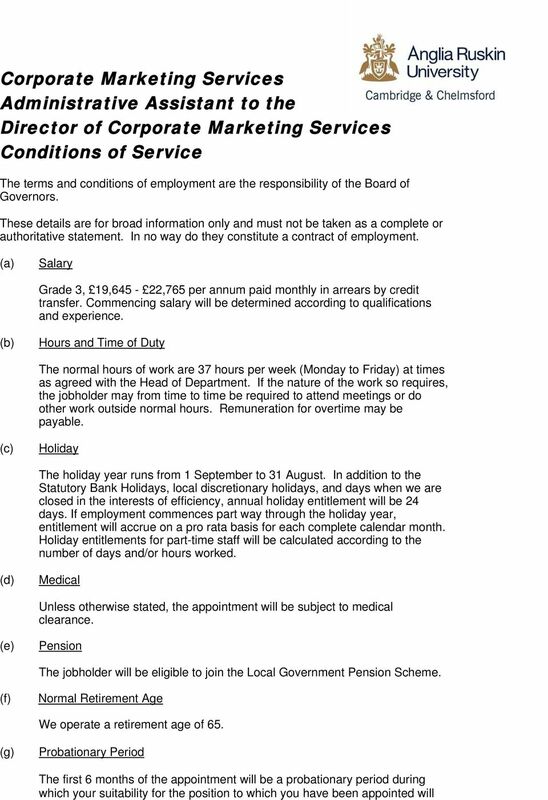 (i) Closing date The closing date for this job is 04 December 2008 (12 noon). JOB DESCRIPTION. Reporting directly to the Facilities Project and Admin Manager. JOB DESCRIPTION. The role holder will be required to develop codes in response to on-going project development and evaluation. JOB DESCRIPTION. To work flexibly and contribute to continuous improvement of services provided by the Department. Based at 61 Westminster Bridge Road, Waterloo (SE1) site, the post-holder may be required to carry out duties at other College sites. Job description Job Title: Location: Payroll and Finance Assistant Based at 61 Westminster Bridge Road, Waterloo (SE1) site, the post-holder may be required to carry out duties at other College sites. JOB DESCRIPTION. Director of Corporate Communications. Communications Officer. Editorial Assistant (Alumni and Public Relations) - 0. JOB DESCRIPTION. To ultimately liaise with departmental editors across the institution regarding development of their areas of the corporate site. FURTHER PARTICULARS. The position offers excellent career development opportunities within academic administration. Work with the business to establish the priority of the project within the context of QAA's portfolio of initiatives. Date as Postmarked Reference: 10104 Financial Accountant Thank you for your interest in the above post, please find the specific role requirements and duties for this post detailed within this document. Accountant. Applications are invited for the position of Accountant for UCL Consultants Ltd.
JOB DESCRIPTION. To take design and developmental responsibility for the University s outward-facing web sites in liaison with the Web Manager. 1. JOB TITLE: Front-End Developer JOB DESCRIPTION 2. HRMS REFERENCE NUMBER: HR15008a 3. ROLE CODE: WEBDEVMRA 4. DEPARTMENT: Marketing Recruitment and Admissions 5. ORGANISATION CHART: See Appendix A 6. PERSONAL ASSISTANT (PA) & RECEPTIONIST. Applications are invited for the position of PA & RECEPTIONIST at UCL Business PLC. PRSONAL ASSISTANT (PA) & RCPTIONIST Applications are invited for the position of PA & RCPTIONIST at UCL Business PLC. The following application information is enclosed: 1. Information on UCL Business 2.